On Wednesday, Oct. 27 at 7 p.m., a community discussion was held to provide an open space where students could talk directly to the University of Rhode Island Police Department and voice their concerns, called the “Real Conversations at Home.” The Rhode Island Student Union Project, one of the groups present at the event, voiced their concerns for URI police having guns on campus. Coming to the community discussion, the Rhode Island Student Union Project wanted to start a counter-conversation at the same time in order to put forward the position that URI police need to be disarmed. 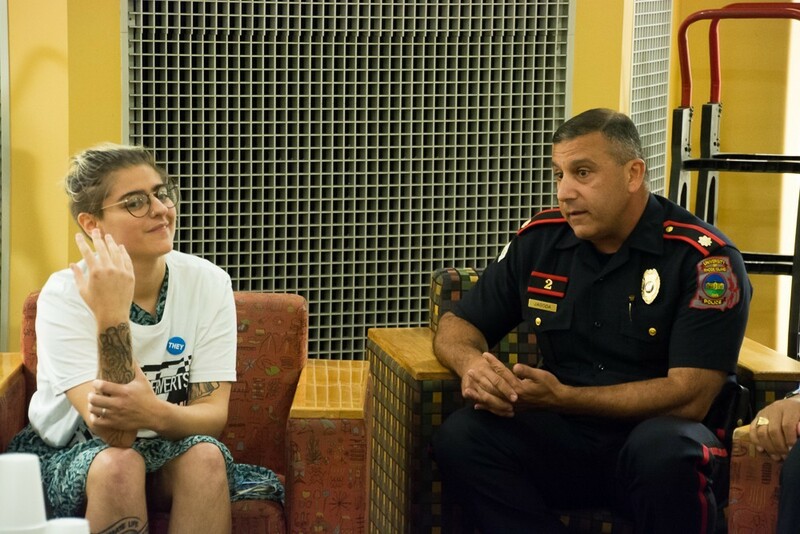 As of May 2015, campus police has made the transition to consist of armed police officers, joining a growing number of college campuses across the nation. At the time, there were 26 armed officers at the Kingston campus and two at the Providence campus. According to members of the police, it wasn’t an easy decision and a lot of thought, meetings and discussion went into making the final verdict. The students used examples of previous gun violence against minorities, such as the killing of Trayvon Martin and the very recent shooting of Scout Schultz, suicidal transgender student on the campus of Georgia Tech, to argue against arming campus police. 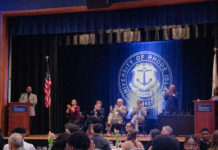 People raised the possibility of making the University more private in order to make sure people with intent to harm students couldn’t easily get in, however members of the Rhode Island Student Union Project argued that it would raise tuition higher than it already is. “I fundamentally disagree with the idea that giving the police guns make us safer,” said a representative of the Rhode Island Student Union Project. The Rhode Island Student Union Project proposed an idea of “student run safety teams,” which would be used as an alternative to the police, but objections were raised as to what would happen if an armed individual were to walk on campus. Students from the Rhode Island Student Union Project also argued that the justice system “upholds the institution of slavery,” and that “cops are inherently racist because of the institution they’re in.” Because of this, they feel that the campus is unsafe because police are armed with dangerous weapons. The URI police commissioner insisted that they never hope to use these weapons, but that they do need them if a crisis were to emerge on campus where there was someone armed with the intent to kill. There was also talk of keeping the firearms in specific locations locked up around the campus where police could access them when needed, however, there was the issue that if there was someone with the intent to kill, seconds matter, and the URI Police have to go into whatever building the call is coming from alone. Facing those dangers, and more lives being at stake when the time is taken to retrieve arms from designated areas. makes their purpose almost futile. The URI police assured the members of the Rhode Island Student Union Project that their officers went through rigorous training in order to be able to handle these weapons, but the students still stood by their beliefs, saying that they weren’t going to feel safe on this campus until the URI police were disarmed.